For decades, the site in Crown Point, Indiana served as a dry cleaner and was unsuitable for redevelopment. In four months, EnviroForensics has successfully remediated contamination at the old Family Pride Cleaners, 600 N. Main Street, by using thermal remediation. 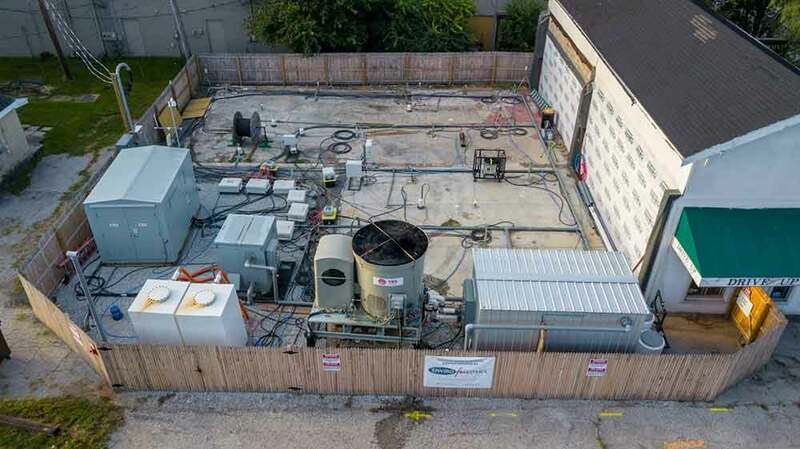 More traditional cleanup techniques can take between five and seven years to complete but using an innovative thermal remediation technology to heat the soil and groundwater beneath the former dry cleaner, levels of contamination in the treatment area were effectively eliminated in just 120 days. The property has a long commercial history, including being the site of a beverage manufacturer in 1921. A dry cleaner operated at the property between 1961 and 2012, after which time the resulting contamination had rendered the site uninhabitable. As with most dry cleaners, the cleaning process involved using a solvent called perchloroethylene (Perc) to remove grease and stains from garments and fabrics. Perc is a hazardous chlorinated compound that is delivered to dry cleaners as a liquid. Over the years during dry cleaning operations, especially during the time before the formation of the Environmental Protection Agency (EPA) and applicable regulations, small inadvertent spills occurred which caused the soil and groundwater beneath the building to become contaminated. Thermal remediation technology reduced contamination by 99% in just four months. As mentioned in an October 19th IndyStar article, the soil heating technology that EnviroForensics implemented during the cleanup increased the temperature of the soil and groundwater to near boiling, which essentially created a vapor of steam mixed with the Perc that was then captured and collected by above ground equipment. The collected Perc was then disposed of properly. Once subsurface temperatures reached near boiling temperature, the system operated for three months. Within this short time, the site contamination was reduced by over 99%! Now that the property is suitable for use, the property owner is currently working to redevelop the property and make it a part of the dynamic downtown Crown Point community again.